Green plants have been used for many years for their biological activities. Many species of Zingiberaceae family have been studied for their potential biological activity. Alpinia galanga from the family Zingiberaceae has been widely used decades ago and is still used for traditional and medicinal purposes. Easy availability and low cost has enabled more people to benefit from this dynamic plant. Studies have been conducted widely using the rhizomes, leaves, flowers, pseudostems and seeds apparently to explore its potential. Active compounds such as 1,8-cineol, α-fenchyl acetate, β-farnesene, β-bisabolene, α-bergamotene, β-pinene and 1’-acetoxychavicol acetate from Alpinia galanga plant. Among all the bioactive compounds, 1,8-cineol known as marker compound in the Alpinia spp provide strong biological activity. Active compounds from this plant cause variety of biological activities such as antibacterial, antifungal, antitumor, antiulcer, antiallergic, antioxidant effect and insecticidal activity. Therefore this is the latest information on the biological activity and the active compounds of Alpinia galanga. Greater galangal, Alpinia galanga, Zingiberaceae, 1,8-cineol and Biological activity. Alpinia galanga is a species of ginger that occur in tropical Asia. The richest area is the Southern Asian region, a floristically distinct region that includes Malaysia, Indonesia, Brunei, Singapore and Philippines . Alpinia galanga belongs to Kingdom of Plantae, Order of Zingiberales, Family of Zingiberaceae, Genus of Alpinia and Species of Alpinia galanga. The common names for A. galanga is Greater galangal in English, Lengkuas in Malay, Hong doukou in Chinese, Arattai in Tamil and Kha in Thai. Alpinia galanga bears underground stems called rhizomes which have strong aromatic smell with conspicuously nodes and internodes . The branches are out into different pieces, each of which is from 1 1/2 to 3 inches in length, and seldom more than 3/4 inch thick. Each piece of the rhizome is usually cylindrical in shape, and these are often cut while in a fresh state, each piece of the rhizome is marked at short intervals by the presence of a narrow and whitish color body, which gives rise to raised rings, the legacy of scars produced by former scaly leaves growing along the rhizome. The rhizomes are characterized externally by a dark reddish-brown color, and cuttings of the inner rhizome are characterized by the presence of a dark center surrounded by a wider and paler layer on the outer rim, that also darkens considerably when the rhizome is dried during processing. The rhizomes of galanga have a strong aromatic odor, and a spicy or pungent taste . Previous review has been done on pharmacological activity of A. galanga from its stem up to its bark. This review combines the idea from various current studies which has been done on A. galanga and provides a better understanding of its pharmacology and non-pharmacological activity including insecticidal activity (Figure 1). Figure 1. Rhizome of the Alpinia galanga. Active compounds from the various parts A. galanga were widely studied by many researchers. Many active compounds were successfully isolated and identified by previous researchers. The major active compounds found in A. galanga are 1,8-cineol, α-fenchyl acetate, β-farnesene, β-bisabolene, α-bergamotene, β-pinene and 1’-acetoxychavicol acetate. 1, 8-cineole known as marker compound for Alpinia spp and was reported as most abundant compound in most of the studies on A. galanga . Chemical structures of some major compounds are given in (Figure 2). Alpinia galanga poses antimicrobial activity against various bacteria and fungi. Essential oil from fresh rhizomes of A. galanga exhibits an antimicrobial activity against Trichophyton mentagrophytes . Similarly, the ether extract of A. galanga are more potent than ethyl acetate in antibacterial activity and significantly effective on Staphylococcus aureus and Klebsiella pneumonia . 1,8-Cineole from the ethanol extract of Alpinia galanga was discovered to have antibacterial activity against Staphylococcus aureus. The antimicrobial activity is due to composition of 1,8-cineole, 4-allyphenyl acetate and a-bisabolene . Alpinia galanga also been studied and found to be inhibit a wide range of human pathogenic fungi, zoonotic dermatophytes and yeast-like Candida albicans. The ethanolic extracts poses fungicidal activity against Trichophyton longifusus, Colletotrichum musae and Fusarium oxysporum, Trichophyton mentagrophytes, Trichophyton rubrum, Trichophyton concentricum, Rhizopus stolonifer and Aspergillus niger . Alpinia galanga was found to cause antitumor activity. Active compounds from A. galanga such as 1′-acetoxychavicol acetate and 1′-acetoxyeugenol acetate were isolated as antitumour principles against Sarcoma 180 ascites in mice . The high dose of methanolic extract of A. galanga treated albino mice showed no estrogenic activity rather showed decrease uterine wet weight as well as morphologically constricted uterine horns which clearly suggests anti-estrogenic activity . Two isolated compounds from the rhizomes A. galanga, 1,7-bis (4-hydroxyphenyl)-1,4,6-heptatrien-3-one (BHPHTO) and bisdemethoxycurcumin (BDMC) were examined for their bioeffectivenesses on the human melanoma A2058 and showed that significantly inhibited the proliferation of melanoma cells in the cell viability assay. The research was also taken on the tests to B16-F10 cell line and showed minor inhibitory consequences of cellular tyrosinase activities and melanin contents . The effect of A. galanga ethanolic extract has been studied on experimentally induced gastric ulcers in rats and the findings suggest that a significant antisecretory and cytoprotective action of A. galanga may be responsible for its antiulcer activity . Alpinia galanga was found to be effective in treatment of allergy and the isolated compounds which extract inhibit the release of antigen IgE mediated in passive cutaneous anaphylaxis reactions in mice . Ethanolic extracts obtained from Holy basil (Ocimum sanctum Linn) and Galangal (Alpiniagalanga) showed strong antioxidant activity, acts as radical scavenger and also as lipoxygenase inhibitor . Mahae and Chaiseri, studied antioxidant activities and antioxidative components in extracts of A. galanga. They reported 50% ethanol in water has antioxidant activity when compare with two other samples based on a water extract and the essential oil which determined using the 2, 2-diphenyl-1-picrylhydrazyl (DPPH) and oxygen radical absorbance capacity (ORAC) methods. The ethanolic extracts showed the highest DPPH free radical scavenging ability as well as the highest ORAC value when compared to the water extract and the essential oil . Alpinia galanga have anti-inflammatory and analgesic effects towards rheumatic condition. It acts as therapeutical agent for treating inflammatory immune disorders and induced paw inflammation and granuloma weight. Furthermore, it shows drastic significant effect on reducing symptoms of osteoarthritis  . Phitak et al., reported the effects of p-hydroxycinnamaldehyde from A. galanga acetone extracts on human chondrocytes, Osteoarthritis (OA) is the most common form of arthritis and affects millions of people worldwide and patients have traditionally been treated with non-steroidal anti-inflammatory drugs (NSAIDs), but these are associated with significant side effects . The active compound, 1’S’-1’- acetoxychavicol acetate were found to provide inhibition of the growth of oral squamous cell carcinoma in in-vitro or in-vivo besides potentiating the effect of synthetic drug- cisplatin . Batra et al., reported that 1’-acetoxychavicol acetate inhibits the NF-kB activation and demonstrates the suppression on the generation of tumor in the mice . Alpinia galanga also been studied by several authors for other pharmacological purposes including stomachache  . A. galanga has been used as a medicine for curing stomach aches in China and Thailand . Methanolic extract of A. galanga showed potent inhibitory activity against human immunodeficiency virus type-1 (HIV-1) and human cytomegalovirus (HCMV) . The ethanolic extract of A. galanga is reported to possess hypolipidemic activity. A dose of 20 mg/day of the extract was given for the period of 4 weeks to the rats and results in the reduction in the serum and tissue levels of total cholesterol, triglycerides, and phospholipids significantly increased the serum levels of high density lipoproteins (HDL) in rats. Effects of extract on lipid profile exhibited the efficacy of A. galanga in lowering the risk of arteriosclerosis . The ethanolic extract of A. galanga poses an hypolipidemic characteristic by which a dose of 20 mg/kg of the extract for each day was given to the rats for 4 weeks and resulted in the reduction of total cholesterol and triglyceride level and the phospholipids significantly increases the high density lipoprotein level in the rats. Thus, A. galangal extract has shown a potential to lower the risk of arteriosclerosis . Alpinia galanga was found to exhibit insecticidal activity in previous studies. Hexane crude extract of A. galanga gave the highest control efficiency to adult Bactrocera dorsalis compared to dichloromethane, ethyl acetate and 95% ethanol. Thus, this extract may an alternative way for control this insect pest in the future . The essential oil of A. galanga rhizomes was found to possess strong contact toxicity against Lasioderma serricorne adults and also showed strong fumigant toxicity against L. serricorne adults. Moreover, the essential oil and eucalyptol also exhibited the strong repellency against L. serricorne adults. The study also revealed that the bioactivity properties of the essential oil can be attributed to the synergistic effects of its diverse major and minor components . Abdullah et al., reported that essential oil from A. galanga and 1,8-cineol poses antifeedant, repellent and toxicity activity against asian subterranean termites Coptotermes gestroi and Coptotermes curvignathus . Other studies have shown that A. galanga can also used to control Plutella xylostella and Callosobruchus chinensis  and Sitophilus zeamais, Tribolium castaneum and two parasitoids . Acaricides are present in A. galanga seed extracts showed mortality against Tyrophagus putrescentiae and Dermatophagoides pteronyssinus . For different countries, galanga is used distinctly. In most South East Asian countries dried galanga is employed only in the absence of fresh galanga whereas in Indonesia slices or powder of the fresh or dried rhizome are used frequently. The rhizome is used against rheumatism, bronchial catarrh, bad breath, and ulcers whooping colds in children, throat infections, to control incontinence, fever and dyspepsia . The root has been used in Europe as a spice for over a thousand years, having probably been introduced by Arabian or Greek physicians, but it has now largely gone out of use except in Russia and India. The rhizomes have been used as flavors in native dishes and ingredients in many traditional medicines to treat various ailments, such as stomach disorders and skin diseases. In India the rhizomes have many applications in traditional medicines such as for skin diseases, indigestion, colic, dysentery, enlarged spleen, respiratory diseases, mouth cancer and stomach cancer. It is used as a body deodorizer and halitosis remedy . Aromatic and rhizomatous plant, Alpinia galanga used in various biological activities. Alpinia galanga are rich in photochemical it is an important source of various types of active compounds that poses many biological activities and insecticidal activities. Since A. galanga has been known for its broad range of biological activity. Further research should be carried out on formulating the bioactive compounds of A. galanga with other biologically important plants in order to produce more effective and environmentally safe methods. Therefore this plant has great potential to be highlighted and achieve breakthrough that can help various fields, especially medical and health. Matsuda Het al.Antiallergic principles from Alpinia galanga: structural requirements of phenylpropanoids for inhibition of degranulation and release of TNF-a and IL-4 in RBL-2H3 cells. 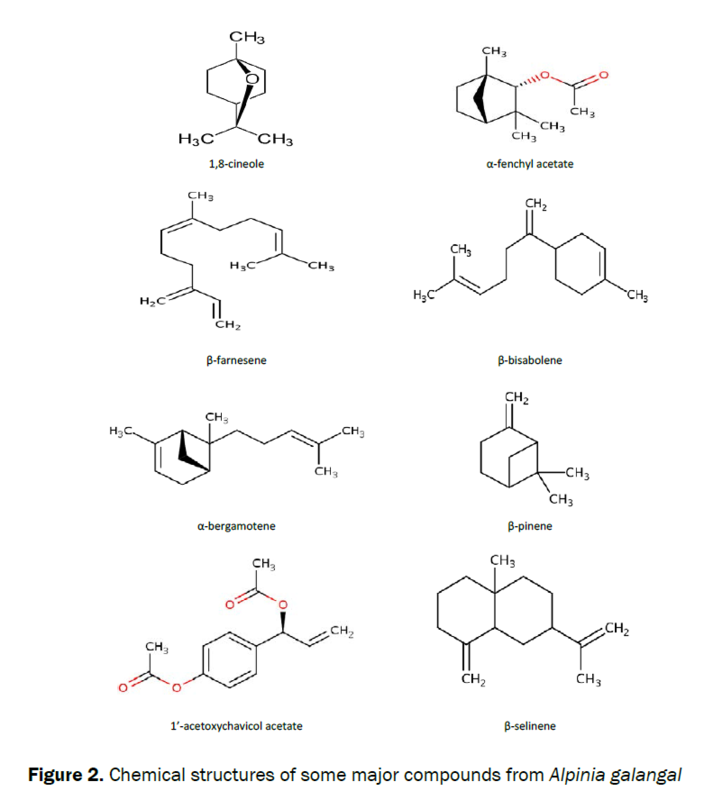 Bioorganic and Medicinal Chemistry Letters.(2003);13:3197-3202. Jirawan O.Effects of the Zingiberaceae spice extracts on growth and morphological changes of foodborne pathogens. Doctor of Philosophy in Food Technology Suranaree University of Technology Academic Year 2005. ISBN. (2005);974-533-463-4. Farnsworth NR, Bunyapraphatsara N (1992) Thai medicinal plants recommended for primary healthcare system, Medicinal Plants Information Center, Faculty of Pharmacy, Mahidol University 402. Abdullah F et al.Chemical Composition, Antifeedant, Repellent, and Toxicity Activities of the Rhizomes of Galangal, Alpinia galanga Against Asian Subterranean Termites, Coptotermes gestroi and Coptotermes curvignathus (Isoptera: Rhinotermitidae). Journal of Insect Science.(2015);15:1-7. Janssen AM, and Scheffer JJC.Acetoxychavicol acetate, an antifungal component of Alpinia galanga. Planta Medica.(1985);6:507-511. Elsamma T, Shanmugam J and Rafi MM.Antibacterial activity of plant belonging to Zingiberaceae family (Alpinia galanga). Biomedicine.(1996).16(2/3):15-20. Tachakittirungrod S and Chowwanapoonpohn S.Comparison of Antioxidant and Antimicrobial activities of Essential Oils from Hyptis suaveolens and Alpinia galanga. CMU. Journal of Natural Science.(2007);6:31-42. Chudiwal AK, Jain DP and Somani RS.Alpinia galanga willd. An overview of phyto-pharmacological properties. Indian Journal of Natural Products and Resources.(2010);1(2):143-149. Itokawa H et al.Antitumor principles from Alpinia galanga. Planta Med.(1987);53:32-33. Singh YR and Kalita JC. Effects of methanolic extracts of Alpinia galanga from Manipur (India) on uterus of ovariectomised C3H albino mice. International Research Journal of Pharmacy.(2012);2:423-427. Chih YL et al.Antimelanoma and Antityrosinase from Alpinia galangal Constituents. The Scientific World Journal.(2013);1-5. Al Yahya MA et al.Gastric Antisecretory, Antiulcer and Cytoprotective Properties of Ethanolic Extract of Alpinia galanga Willd in Rats. Phytotherapy Research.S(1990);4:112-114. Juntachote T and Berghofer E.Antioxidative properties and stability of ethanolic extracts of Holy basil and Galangal. Food Chemistry.(2005);92:193-202. Mahae N and Chaiseri S.Antioxidant activities and antioxidative components in extracts of Alpinia galanga. Kasetsart Journal of Natural Science.(2009);43:358-369. Phitak T et al.The effects of p-hydroxycinnamaldehyde from Alpinia galanga extracts on human chondrocytes.Phytochemistry.(2009);70:237-243. In LLA et al.1’- Acetoxychavicol acetate inhibits growth of human oral carcinoma xenograft in mice and potentiates cisplatin effect via proinflammatory microenvironment alterations. BMC Complementary and Alternative Medicine.(2012),12(179):1-14. Batra V et al.Effects of the tropical ginger compound, 1’- acetoxychavicol acetate, against tumor promotioninK5.Stat3C transgenic mice. Journal of Experimental & Clinical Cancer Research.(2012);31:1-14. Jirovetz L et al.Analysis of the essential oils of the leaves, stems, rhizomes and roots of the medicinal plant Alpinia galanga fromsouthern India.Acta pharm.(2003);53:73-81. Yang X, and Eilerman RG.Pungent principle of Alpinia galanga (L.) Swartz and its applications. Journal of Agricultural and Food Chemistry.(1999);47:1657-1662. Tewtrakul S, Subhadhirasakul S and Kummee S.HIV-1 protease inhibitory effects of medicinal plants used as self-medication by AIDS patients. Songklanakarin Journal of Science and Technology.(2003);25:239-243. Achuthan CR and Padikkala J.Hypolipidemic effect of Alpinia galanga and Kaempferia galanga.Indian Journal of Clinical Biochemistr. (1997);12:55-58. 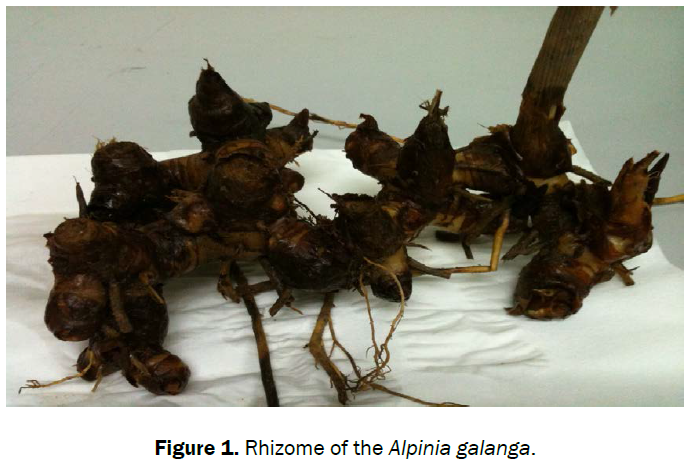 Sukhirun N, Pluempanupat W and Bullangpoti V.Impact of Alpinia galanga rhizome extract on Bactrocera dorsalis population. Communications in Agricultural and Applied Biological Sciences.(2010);75:399-403. Wu Y et al.Composition of the essential oil from Alpinia galanga rhizomes and its bioactivity on Lasioderma serricorne. Bulletin of Insectology.(2014);67:247-254. Riyanto DS and Ohsawa K.Lethal and antifeedant substance from rhizome of Alpinia galanga Sw. (Zingiberaceae). Journal of Pesticide Science.(1998);23:304-307. Suthisut D, Fields PG and Chandrapatya A. Fumigant toxicity of essential oils from three Thai plants (Zingiberaceae) and their major compounds against Sitophilus zeamais, Tribolium castaneum and two parasitoids. Journal of Stored Products Research. (2011);47:222-230. Yamahara J.Acaricides containg Alpinia galanga seed extract or phenylpropanoids. Jpn. Kokai Tokkyo Koho, JP 10087418 A2 19980407 HEISAI. Application: JP 96-243361 19960913,(1998);5. Lee CC and Houghton P.Cytotoxicity of plants from Malaysia and Thailand used traditionally to treat cancer.Journal of Ethnopharmacology.(2005);100:237-243. Gupta RK (2010) Medicinal and aromatic plants. 1st Edition.468-469.